“I don’t see my role as someone who gives direction,” says Hendrik Weber, aka Pantha du Prince, in our new short documentary. “I filter the sound from each musician.” Coming from a background making electronic music as a solo artist, it was the sound of church bells that first piqued Hendrik’s interest in working with acoustic musicians. While recording the ancient bells from a variety of locations for his album, Black Noise, Hendrik envisioned a collaboration between himself (on electronics and laptop) and acoustic musicians. The results can be seen in the short film below, and heard on Elements of Light, Hendrik’s collaborative album with The Bell Laboratory, a group of world-class percussionists. Assembling such a project required creative and technical thinking, bridging a gap between the raw expression of The Bell Laboratory and Hendrik’s effect-heavy role as a “filter”. In the midst of a series of sold-out performances around the world, we managed to capture Hendrik and the Bell Laboratory as they performed Terry Riley’s “In C”, a landmark work of minimalist experimental music. The performance takes place at London’s Barbican Centre where the musicians were joined on stage by The Joshua Light Show, a veteran liquid light show founded in the psychedelic ‘60s. 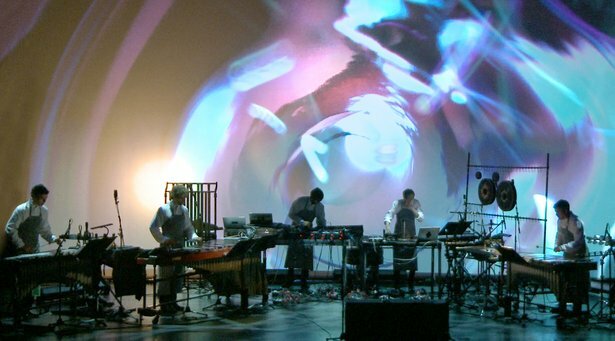 Take a deeper look at the percussion instruments and Ableton Live setup behind the performance.